Should I or shouldn’t I? I mean, really, what’s the worst thing that could happen if I climbed this rickety ladder? Maybe I shouldn’t have asked that question because my mind suddenly started to answer with many a scary scenario. I could fall. I could seriously hurt myself in the fall. I wouldn’t be able to call for help, as there was no cell signal in this part of Vermont in which our little red house sat sweetly in a valley surrounded by fields and views of the Green Mountains. I would be alone and hurt with no help coming anytime soon as my husband had not yet joined me for our visit to our little homestead. I would be left there on the grass risking the chance of a garter snake slithering upon me. Eeek. Garter snakes. I don’t like them. My mom and dad recently reported that on one of their visits to our little red house they saw a “huge” one slithering underneath the apple tree. Of course, the snake grew larger as their story continued. Still, I wouldn’t want to risk meeting said snake no matter how small or large it was. What’s the worst thing that could happen if I decided to climb this rickety ladder I had just wrangled out of the damp, stone cellar, and set before me on the uneven ground below me, all because I couldn’t live one more minute with what my husband could live with forever? I just couldn’t live with the strips of paint peeling from the beaten-up-by-too-many-harsh-winters clapboards that sided our home. Something had to be done. I grabbed hold of the ladder with one hand and hesitantly put my foot onto the first rung. My heart started thumping harder. Up onto the next rung my foot went. Then the next and then the…wait, I had forgotten something. I had forgotten the can of paint and paintbrush. Back down I went and grabbed the necessary items needed for painting, wondering all the while how was I to hold on to dear life…and the ladder…and the paint can and the brush? As one who loves to take on the challenge of a “can’t be done” project, I fought my fears and went back up the ladder, balancing each step I took with the can and brush in one hand while the other hand grabbed the next rung. I finally came to the first patch of peeling paint and leaned over to scrape it off. As I leaned I made the mistake of looking down. Our little house didn’t look that tall but from where I was, “down” looked like a very long way to go. Sweat came dripping down my forehead as I whispered: “Hold it together.” “Breathe.” “Don’t think about it.” “I can do this.” I scraped quickly and then threw the paint over the bare spot. My sense of accomplishment was short lived for I realized while one piece of peeling paint was dealt with, there were many more taunting me further up the house. It was then I had to ask myself the very question my husband asked while trying to persuade me to leave the ladder where he had put it—in the cellar. Why does the peeling paint bother me so much? 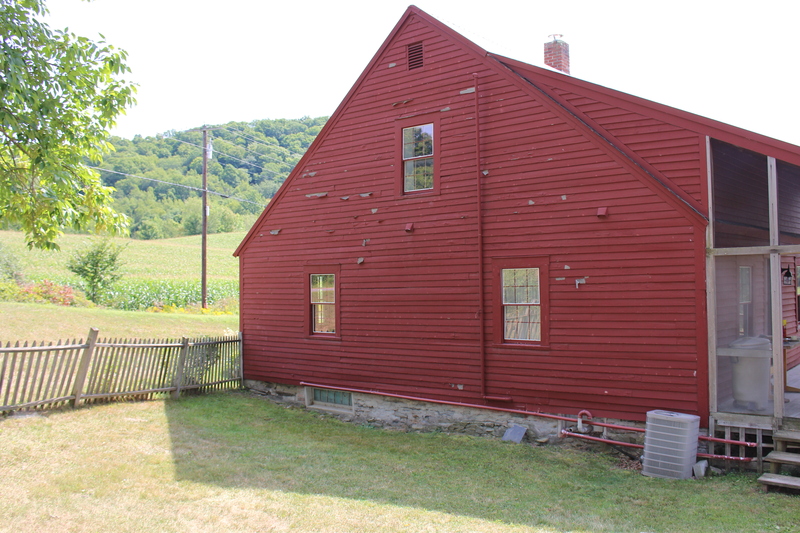 Peeling paint exposes more than weathered clapboards; a lesson of the heart is revealed as well. But there was more going on than just what would the neighbors think. In some way the peeling paint was symbolic of everything I was taught you had to fix or cover up in life. Now my parents, who had more of my husband’s “no cares” attitude, didn’t teach me this. This need to be perfect or have your act together or at least appear to have your act together was instilled in me during my days as an aspiring Manhattan magazine editor. It was there in the city in which Sinatra sang, “if you can make it there, you’ll make it anywhere,” I saw firsthand how life’s disappointments, hurts, flaws, and even painful scars, were all too easily—and expected to be—painted over with whatever paint you could find. Lonely? Paint over it by working longer and harder. Heartbroken? Paint over it by rushing into a new relationship quickly. Don’t give the brokenness anytime to heal. Dissatisfied with yourself? Paint on a new persona, workout more, buy new clothes, and get a makeover. Do whatever you can to cover up the peeling parts of your life because you don’t want the world to see the weather-beaten clapboards that are hidden underneath in your heart. For it is more than just an eyesore. It is a reminder of our own finitude and vulnerability. And no one wants to be reminded of that. So let there be no peeling paint in life—ever. Yet here I was with peeling paint and a husband who just didn’t seem bothered by it at all. His “no one cares” attitude was strengthened by his other observation. “Everyone around here lives with peeling paint,” he said. And they do. There wasn’t an urgent need to cover up what tough seasons had scarred, be it the tough seasons of Mother Nature herself or the tough seasons that barrel down on us in our life—illness, fractured relationships, financial worries, death. If anything, the peeling paint on display all around me in so many ways provided the space to face finitude and vulnerability without dread or fear or the feeling of failure or hopelessness. The peeling paint was in fact a shared communal experience no one judged, but rather, was understood by all. It was simply a part of life not to be covered up. It was a part of life to accept, embrace and learn to live with. And the learning to live with? Well, that’s when an eyesore miraculously becomes something beautiful and amidst the newly discovered beauty before you is where healing begins. As I stared at the marred side of my Vermont homestead, I saw the beauty before me and in that beauty I realized something. It was here in a place where paint peels freely, the weathered clapboards of my own heart were accepted and welcomed and loved by a community which knew the truth so many of us try to deny. In life, paint will indeed peel. There really is no need to rush and cover it up. This entry was posted in Uncategorized and tagged clapboards, community, finitude, heart, ladder, paint, paintbrush, peeling, Vermont, vulnerablity, weathered by accidentalcountrypastor. Bookmark the permalink.